Eamonn Ryan was at the helm as the Rebelettes were crowned champions for the seventh time in eight seasons. 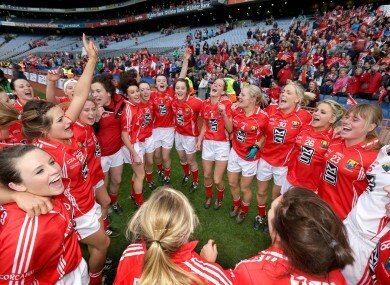 Cork players celebrate winning the All-Ireland ladies senior final. Cork were crowned TG4 All-Ireland Ladies senior football champions for the seventh time in eight seasons at Croke Park yesterday afternoon. A dominant display from the Rebelettes crushed Munster rivals Kerry in the showpiece decider at GAA HQ. 16,998 spectators watched Cork collect the Brendan Martin Cup for the second successive year and since 2005, Eamonn Ryan’s all-conquering players have lost just one championship match, against Tyrone in 2010. That Banagher defeat was described by Ryan as a “pebble in the shoe” and it’s ensured that the Leesiders have bounced back to claim back-to-back All-Ireland titles. Kerry, contesting a first All-Ireland senior decider since 1993, suffered a first-ever defeat in the showpiece fixture, as Cork maintained their unbeaten record in senior finals. Kerry set out to contain Cork as boss William O’Sullivan made a number of positional switches. The Kingdom packed their defence but as a result, they struggled desperately for scores at the other end. Sarah Houlihan carried the fight to Cork in attack and goalkeeper Edel Murphy kept a clean sheet but overall, this was a chastening experience for Kerry. Lorraine Scanlon, named at midfield but deployed at full-forward, enjoyed some good moments but Cork generally dealt well with the aerial bombardment. For Cork, wing backs Briege Corkery and Geraldine O’Flynn were in magnificent form, surging forward from defence and putting their opponents on the back foot. Three of Cork’s six starting forwards failed to register a point from play but the scoreboard kept ticking over with regularity nonetheless. Doireann O’Sullivan was a revelation at centre forward, notching four points from play, while Valerie Mulcahy collected six of her seven points from placed balls. The free count heavily favoured Cork – 32-11 – and O’Sullivan admitted his displeasure with some decisions against Kerry after the game. But O’Sullivan acknowledged that Kerry, who lost the Munster final by six points to Cork, could have no complaints with this latest defeat. They went fourteen minutes without a score in the first half and trailed at half-time by 0-3 to 0-10. Cork stormed into an early 0-3 to 0-0 lead before Kerry scored their opening point in the tenth minute, courtesy of Houlihan. To their credit, Kerry denied Cork any real goalscoring opportunities but the champions were happy to take their points when the chances presented themselves. On the stroke of half-time, Orlagh Farmer kicked a majestic point and the half-time hooter sounded as the ball sailed over the bar. Kerry did land two successive points for the first and only time early in the second half but they never looked like launching a revival. And their misery was complete in the final minute when star forward Louise Ní Mhuircheartaigh went to the sin bin after picking up a yellow card. It later emerged that Kingdom skipper Bernie Breen sustained a serious shoulder injury early in the game but the Laune Rangers star played the entire hour nonetheless. This latest success for Cork means that eleven of their starting line-up have now collected seven All-Ireland medals, while sub Angela Walsh has also featured in each of those All-Ireland successes since 2005. CORK: E Harte; A.M. Walsh, B Stack, D O’Reilly; B Corkery, R Buckley, G O’Flynn; J Murphy, N Kelly; O Farmer, D O’Sullivan, C O’Sullivan; N Cleary, V Mulcahy, R Ní Bhuachalla. Subs: Angela Walsh for A.M. Walsh (38), O Finn for Ní Bhuachalla (38), L McMahon for Farmer (46), A Hutchings for Kelly (53), Annie Walsh for C O’Sullivan (57). KERRY: E Murphy; C Lynch, A Desmond, A Lyons; J Brosnan, A Leonard, L Galvin; E Sherwood, B Breen; C Kelly, D Corridan, S Houlihan; M O’Connell, L Scanlon, L Ní Mhuircheartaigh. Subs: P Dennehy for Corridan (24), M Fitzgerald for Galvin (44), D Corridan for O’Connell (58), S.J. Joy for Sherwood (58). Email “Cork secure ladies senior football glory”. Feedback on “Cork secure ladies senior football glory”.